Digimon Adventures sequel staring a seventeen year old Tachi in High School. Nanoha gets a 4th season, which is something people didn't expect to hear until after the movie. I probably would've preferred Force over Vivd but honestly neither are very good. At least those HD remaster BDs are on their way as well. There's too much fan service, but the manga's great otherwise. They just announced the number of cours for Durarara! !×2 (and when they'll air, respectively), and it's actually going to be *three* split-cours! Also: There's now a preview, as well! MangaRocks! wrote: They just announced the number of cours for Durarara! !×2 (and when they'll air, respectively), and it's actually going to be *three* split-cours! Also: There's now a preview, as well! Meh, I'll cross that bridge when I come to it. Considering it's Durarara!! and therefore will be fantastic, chances are I'll just watch the sub and rewatch the dub when it comes out. Koe no Katachi/The Shape of Voice/A Silent Voice is getting an anime! There's not much information yet, but hype starts now I think. YES! YES! YES! I've only read like six chapters but I already love the manga and keep thinking it should so be an anime and YEAH! I'm always looking for a good romance - this is welcome news. PLCDreamcatcher14 wrote: YES! YES! YES! I've only read like six chapters but I already love the manga and keep thinking it should so be an anime and YEAH! Heck, I saw that coming several dozen miles away. After reading a sample from Crunchyroll, the first thought coming to mind was, "Yeah, this thing's definitely getting animated." ForeverInspired wrote: I'm always looking for a good romance - this is welcome news. While it has some elements of that, it's much more a drama than a romance (barring anything that happens in the last chapter, which I haven't read yet). I guarantee it'll still be worth your time though. If it has drama, that's even better! Not only do I love drama, but it is also supposedly my favorite category... and I'm fine with that...http://mal.oko.im/ForeverInspired/profile. Hosoda is back to save anime in July of next year. ^ Yay! This should be good. MangaRocks! wrote: Mushishi's not over yet! Runs around the house screaming! new Key/Jun Maeda anime!!!!! hyyyyyyype!!!! New Gintama anime. Best news I've had in a long, long time. I hope there is more Kamui because...Kamui. I personally don't care for Kamui, but I can't wait for more Gintama! o: Woot woot! This new Charlotte anime by Key, does it actually have a tie-in/crossover with Angel Beats? Or is it just that Jun Maeda has a hand in both? ARIA is getting a new anime! Details are scarce at the moment, but more ARIA is almost guaranteed to be a good thing. 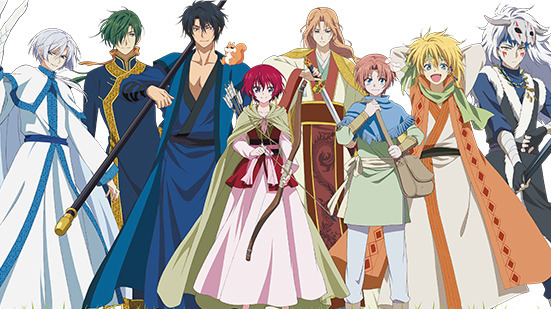 Akagami no Shirayuki-hime is getting an anime!! I’m soooo nervous… Studio Bones is really hit-and-miss for me. But I’m really excited too. I’ve been hoping for an anime. So I’ll join you in the optimistic waiting boat. I think that Bones will do the show justice. I find that Bones has a harder time with original content (ex: Captain Earth and Space Dandy). There are a few exceptions (ex: Star Driver), but it really shows in their history that Bones doesn't do as well with original content. I mean, this company has produced the awesome Noragami, Blast of Tempest, Scrapped Princess, Fullmetal Alchemist, Ouran High School Host Club, Jyu-Oh-Sei, and Darker than Black. Granted, these had excellent source material, but from what I am hearing, Akagami no Shirayukihime has it as well. I've been ranting on how Bones has been slacking while Studio Pierrot has been excelling, but this might just be the spark they need after Noragami. Further, Bones is by far one of the best animators along with Production I.G., so all they have to do is live up to the potential of the source material (which they are good at doing). To be honest, I am pretty optimistic at this match. I don't know if anybody heard of this news, but I'll put it here anyway. Swimming Anime the Movie Free! prequel based on the High Speed novel, releasing December 2015. As long as no one is taking anyone else on a self-discovery trip to Australia I'll be happy. Cycling Anime the Movie Yowamushi Pedal movie with an original story by the manga author, releasing this summer. Another Steins;Gate sequel (which actually seems to be a *midquel*, given its apparent timeframe)-- Steins;Gate 0-- anime (and game) announced! Mentally/logically, I'm not necessarily sure if want, since the original series + "Oukoubakko no Poriomania" OVA + "Fuka Ryouiki no Déjà vu" movie were already perfection, and tied things up beautifully; however-- given its apparent timeframe, as aforementioned (namely, SPOILER: Highlight text to read: the bad-end Beta worldline, which, I'm not gonna lie, I've always been a bit curious about)-- there is certainly plenty of room to expand the story in that area (and hey, even those random little IBM commercial specials were good, LOL! ), so my heart is not-so-secretly fangirling. Here's hoping ...0 is great!